In the 1970's an English "ærospace" company built, under the names "Lambert" and "Viscount", surprisingly inexpensive, very lightweight bikes made with "ærospace" tubing. Now, that, in itself is not as impressive as it might sound since the aerospace industry specs a pretty wide variety of steel tubes for different applications. The tubing used was straight-gauge chrome-moly steel; the Viscount version of the bike had a detailed sticker on the seat tube detailing the type of tubes used, throwing in a few references to military specs, etc. Lambert Bicycles were later called "Viscounts" after the company was purchased by Trusty in 1975 or 1976. After being imported to the United States, Viscounts made quite a splash in the bike-oriented magazines and were favorably reviewed. The light-gauge steel tubing made for a 3.75 lb frame (56 cm) and the total bike was claimed to weigh in at between 19 and 21 lbs, depending on whether it was the clincher or tubular model. 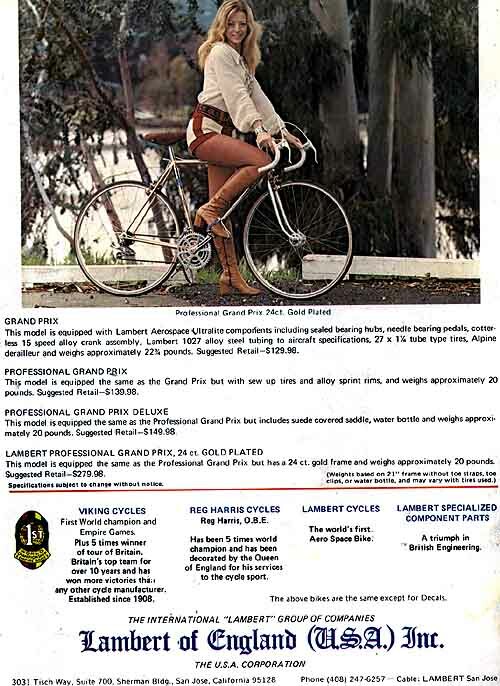 Most Lamberts were fillet brazed from lightweight straight-gauge chrome-moly tubing, which was decent enough but prone to cracking at the seat tube/bottom bracket juncture. The rear dropouts, which were horizontal, were Shimano models in the first production frames but were downgraded to an unbranded (and softer) version in later models. The bikes (both Lamberts and Viscounts) came with a cast aluminium (aluminum) fork which was pinned to a steel steerer tube. Early production didn't even have the pin. This fork was the main problem as it had a tendency to snap off the steerer tube with predictably unfortunate consequences to the rider. UNDER NO CIRCUMSTANCES SHOULD A LAMBERT OR VISCOUNT BE RIDDEN WITH THE ORIGINAL CAST ALUMINUM FORK!!!!!!!!! (Having said that, I ignorantly rode my Viscount with the original fork for 8 years including many 40-45 mph descents in the bluff country of southeastern Minnesota for 6 of those years. The patron saints were working overtime for me!). Yamaha purchased the Viscount in 1978 or so and promptly recalled every cast aluminum fork ever sold on a Viscount or Lambert, replacing them with a chromed steel Tange fork. There were some other oddities, such as press-fit cartridge bearing bottom brackets (the spindles have a tendency to snap at the circlip groove), and what appeared to be a TA pattern crankset with a Lambert/Viscount-specific large chainring (an aluminum plate with large round holes cut out of it; distinctive and quite attractive in a way). It was unusual to find cotterless cranks on bikes in this price range at the time. Most of them, unfortunately, used a badly designed crank/axle fitting with a non-tapered square fitting, rather than the normal tapered square. The Viscount version came with a Shimano Crane rear derailleur and Titlist front derailleur, anonymous bars, and Viscount-branded stem, 26.8 mm seatpost, a leather saddle and Viscount-branded centerpull brakes which were either GB or GB knockoffs. It was available in a 27" clincher version (IRC 27 x 1 1/8 tires on Weinmann rims) or a 700C tubular version. There was also a model with steel rims. All models used large flange hubs which appeared to be Normandy copies. As was the fashion in the '70's, there were no braze-ons on these bikes. Water bottle cages, brake cables, derailleur cables, etc. were all held on with clips and clamps. All in all, the Lambert/Viscount bikes were a very interesting chapter of cycling history. In it's original condition it should be a display bike. If it's going to be ridden the aluminum fork must be replaced for safety's sake. Replacing the bottom bracket spindle would be a good idea for a bike that will be ridden regularly, although the unthreaded BB could pose a problem. Cycles de Oro has a Lambert Page, focussing more on the collector's perspective. Need a bottom bracket for your Lambert/Viscount? Bike Cult can help! has no connection with the older models discussed above, just the same name.